The Purchase Decision Network and its leading mobile shopping apps present their favorite brands of chips and dips just in time for March Madness. I was a little surprised to see just the old standbys in this list. With all the emphasis on healthy alternatives these days I was expecting some new entrants catering to those tastes. The Purchase Decision Network PDN, a network of leading mobile shopping list applications with more than 8MM monthly users who make more than 30MM shopping trips a month (http://www.pdnmedia.com) surveyed its user base to determine their favorite brands of chips and dips. 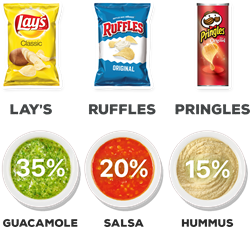 Lay’s (25%), Ruffles (20%) and Pringles (17%) are the top 3 choices in the favorite chips category. In the dips category Guacamole led with 20%. The runner up was Salsa with 18% while Hummus took third place with 14%. Homemade dips at 8% are only slightly more popular than homemade chips at 4%. For the complete list of Chips and Dips offered in the survey and their rankings you can go here. “We decided to focus on just potato chips. I was a little surprised to see just the old standbys in this list. With all the emphasis on healthy alternatives these days I was expecting some new entrants catering to those tastes.” said Sean Flynn, CEO of PDN. The Purchase Decision Network (New York) is the first native advertising network for CPG brands. PDN includes shopping apps that reach consumers across the purchase path as they plan, shop in stores and engage with the brands they love. PDN powers over 30MM shopping trips a month through best selling apps including Our Groceries, Buy Me a Pie, Scan2List and PDN’s own Shopper**. **Shopper saves users time and money every day by organizing shopping lists, suggesting great recipe ideas, and suggesting grocery coupons. Visit http://www.MyShopperApp.com for more information and to download the application.